"Our results challenge the theory of galaxy evolution." One of the first three molecules to have been discovered in the interstellar medium — the matter existing in the space between a galaxy’s star systems — is a carbon hydride ion (CH+). Since its discovery back in the early 1940s, this molecule has remained largely mysterious. For one, it seems to disappear quicker than other molecules while also being extremely reactive. A team of astronomers has now shed light onto what exactly the mysterious CH+ does in space, specifically in turbulent cold gas reservoirs that surround the cosmic star formation known as starburst galaxies. Using the European Southern Observatory’s (ESO) Atacama Large Millimeter/submillimeter Array (ALMA), the researchers spotted strong signals of CH+ in five of the six starburst galaxies they studied, which included the so-called Cosmic Eyelash. “CH+ is a special molecule. It needs a lot of energy to form and is very reactive, which means its lifetime is very short and it can’t be transported far. CH+ therefore traces how energy flows in the galaxies and their surroundings,” ESO astronomer Martin Zwaan said in a press release. 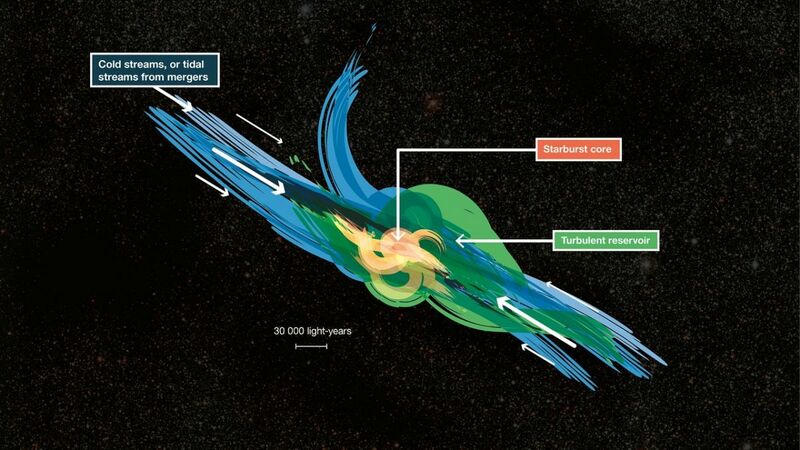 Essentially, starburst galaxies “are among the most extreme star-forming engines in the Universe, producing stars over about 100 million years,” the researchers wrote in the study, which was published in the journal Nature. The faster rate of star formation is fueled by the large reservoirs of cold molecular gas that move towards the starburst core, while also experiencing feedback from surrounding stars or other galactic nuclei. Studying this interplay was made even more possible by the detection of CH+, which revealed dense shock waves which are generated by hot, fast galactic winds that come from inside the starburst galaxies’ star-forming regions. “With CH+, we learn that energy is stored within vast galaxy-sized winds and ends up as turbulent motions in previously unseen reservoirs of cold gas surrounding the galaxy,” said lead author Edith Falgarone, an astronomer at the Ecole Normale Supérieure and the Observatoire de Paris, France.